Logging straight through a drainage line. We have just learned that Vicforests’ logging of Parlour’s Coupe has finished. The news came via a media release that found it’s way to us via a third party. At least Vicforests is being consistent in the way it treats this local community – as an afterthought. On the 11th November 2016, with logging of Parlour’s Coupe underway, Vicforests announced: “Once operations have commenced, we are planning on inviting community members to view the operation in progress. This is likely to be mid December, though that is weather dependent. An invitation will be sent out via email.” Suffice to say, we’re still waiting for the invite! Though there’s little point and no community appetite to continue playing Vicforests’ games. Most of the timber cut from Parlour’s coupe has become firewood for the domestic market. Yes, there were probably a few sawlogs in there, though we seriously doubt that much was turned into “high quality timber flooring and furniture”. At $85/cu m for firewood (retail), the contractor (who also has a large, local firewood business) has every incentive to use the wood he’s cut down, for his own business – who can blame him. Without a doubt the community pressure that resulted in the shift from clear-fell to selective logging is an improvement. But the devil, as always, is in the detail and more on that another time. But that’s all really beside the point. Logging in the Strathbogies should not currently be occurring, because neither the government nor Vicforests have made any attempt to assessed the forest’s values; the location of the proposed coupes is based solely on timber values and completely ignores other values that are equally, perhaps even more important. Such an approach in a forest as small, isolated and cut-over as the Strathbogie Forest will lead to further degradation of forest health and a diminished local environment for visitors and concerned residents – no doubt about that. So, having trashed 30 ha in the heart of some of the best quality forest remaining in the Strathbogies, and gearing up for more, Vicforests believes that logging Parlour’s Coupe was completed “without complications”. I guess that’s true if you don’t care about tomorrow. “The single-tree selection method that was used for this operation is low-intensity and leaves more trees behind than are taken.” A meaningless statement, that may or may not be true. We’ll never know because the the trees to be retained weren’t marked! But it does highlight that this is just a numbers game for Vicforests – a tree, is a tree, is a tree. 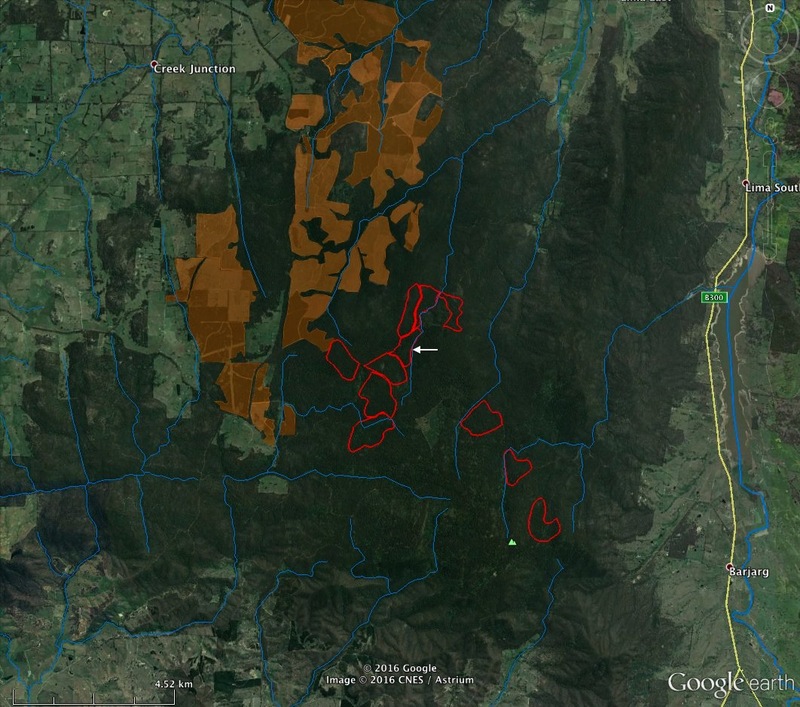 This is Vicforests’ ‘you’ll never even know we’ve been in there’, low-intensity, ‘single tree selection’ logging. Marvel at this sensitive technique that leaves more trees behind than it takes. Note how carefully the single trees are selected to minimize disturbance to the forest. Before logging, this was high-quality Koala, Powerful Owl and Greater Glider habitat – now, it’s a firewood supply. “The younger trees will now begin to grow larger into future sawlogs and the older habitat trees have been left for native wildlife.” VicForest’s business model will likely see these ‘future sawlogs’ become firewood not furniture. And the habitat trees that the contractor so kindly left standing will have their lives shortened (even without a regeneration burn): the coupe will now be hotter and dryer in summer and colder and wetter in winter; the canopies of the habitat trees will be severely buffeted by storms and probably lose limbs, or even be wind-thrown; and the removal of the canopy between the habitat trees means there’s little feeding habitat for those possums and gliders denning in the big old trees. It’s like leaving your home standing, but wiping out the vegie garden and grocer shop. While it’s better than Armageddon aka clear-fell, is firewood-driven selective logging really the best use of our precious Strathbogie Forest? This entry was posted in Community, Forest Issues and tagged firewood, greater glider, habitat, koala, logging, Powerful Owl, selective logging, Strathbogie Forest, VicForests. Bookmark the permalink.